Suggested Usage: As a dietary supplement, 2 capsules capsules each, two to three times a day, or as suggested by a healthcare provider. Uro-Hepa+ is a natural herbal supplement with anti-oxidant, cellular cleansing and cellular energy enhancing activities. 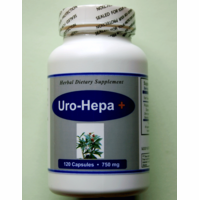 Uro-Hepa+ is also a natural body balancer that allows the body's own mechanisms to support healthy urinary function which cleanses toxic material and bacteria, improves urination flow and helps to eliminate existing stones in kidneys and bladder.